Updated for next year’s riding season is the 2019 Ducati Multistrada 1260 Enduro, revealed ahead of its official launch at the EICMA show in Milan this coming November. 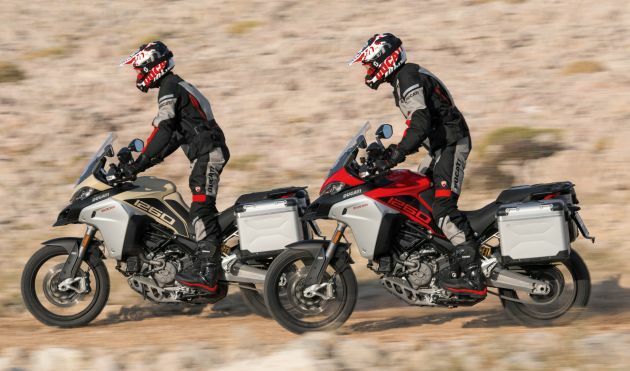 Improvements have been made to the Multistrada 1260 Enduro’s ridability and ease-of-use along with more power being made available lower down the rev range. The new 1,262 cc Testastretta DVT with variable cam timing fitted to the 1260 Enduro gives 158 hp and is smoother in the bottom of the power band. According to Ducati this allows for fewer gear changes, allowing the rider to concentrate on the business of enjoying the ride. A Ducati DQS up-and-down quickshifter is now standard, along with riding modes and a new ride-by-wire setup that gives precise throttle control. This is couple with Bosch Cornering ABS, cornering lights, wheelie control, traction control and vehicle hold control in the Multistrada 1260 Enduro’s suite of riding aids, all of which can be controlled from the Ducati Link app and the rider’s smart phone. Rolling on 19-inch front and 17-inch rear spoked wheels, the 1260 Enduro has a recalibrated Sachs semi-active electronic suspension with 185 mm travel at both ends. Fuel is carried in a 30-litre tank, which Ducati says will give 450 km of range and then some. The 2019 Ducati Multistrada 1260 Enduro will be available in Ducati Red and Sand, appearing in European Ducati dealerships early in the year. A full range of accessories is available from the official Ducati catalogue, including Touring, Sport, Urban and Enduro packages.